The hometown premiere of Sunscapades at this year's Encounters festival went encouragingly well, especially considering the screenings were the first time I'd seen the film with a sizable festival audience. As with all films it's been educational as far as which bits get the strongest reactions but all things considered I couldn't be happier with how it went down. 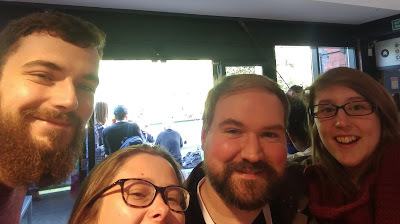 It was also very nice to be able to bring along almost all of the film's modest crew (Laura-Beth, Hannah, Phil and Carwyn) - not to mention me mam - and hopefully come October everyone involved will have gotten to see it on the big screen. Until then the film will be popping up around the world at a few more lovely events. To cap off the week tomorrow night will see it among the launch programme for the Roselle Park Short Film Festival, a branch of the Roselle Park Arts Festival. In Roselle Park, believe it or not. If you're on that side of the pond you can check out the screening at the Climax Brewing Company's outdoor theatre at 5:30pm. One final reminder that if there are any David Lynch/Twin Peaks fans out there who haven't yet made weekend plans, my previous film Klementhro is screening as part of the Lynch Inspired Short Films programme at The Official Twin Peaks UK Festival. According to their social media there are still a handful of tickets left if you fancy snapping them up. 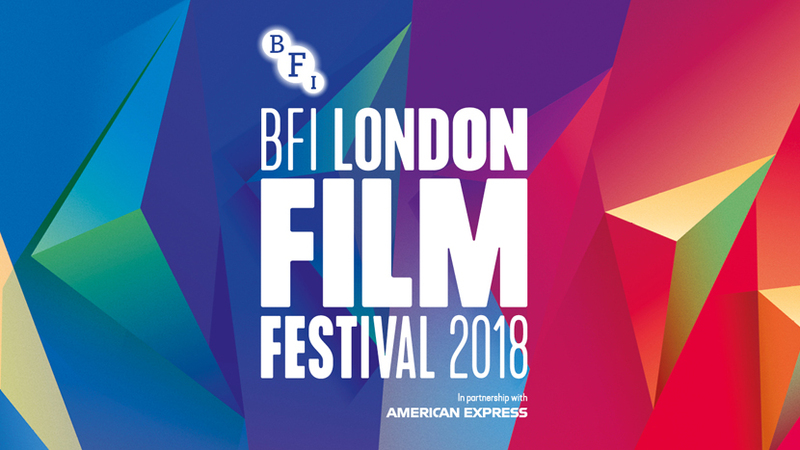 The screenings will take place 3:30pm Saturday 29th and 11:30am Sunday 30th - I'm pretty sure it's the same programme repeated each day but I may be mistaken. At any rate here's the full list of films and you check out the complete weekend schedule here. Drink full and descend! As Encounters is about to kick off it's an exciting time for my new film Sunscapades and hopefully I'll get to see some of you at either the Wednesday or Thursday screening! To mark the occasion I've put up a new sneaky teaser clip for y'all. This is the third and probably final one as any more would give away one of the main story points, but your appetite for my moving doodles is not yet sated you can see the other teasers here and here. 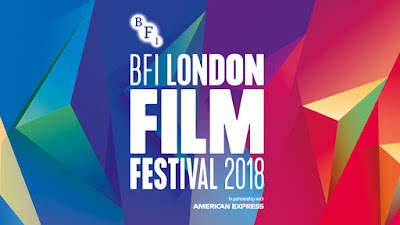 It's worth mentioning also that tickets for next month's BFI London Film Festival - at which the film will also be screening - are now on sale. The Real Horrorshow screening takes place at the Prince Charles Cinema on Sunday October 14th at 3:30pm, then at the Rich Mix Cinema on Thursday October 18th, 6:15pm. If you're thinking of going it'd be best to act swiftly as they're selling fast, so grab 'em up here. With its appearance at The Official Twin Peaks UK Festival looming, my earlier film Klementhro continues to charm its way into programmers' hearts or, at the very least, convince them of its value as tolerable filler material. On October 6th it will be part of the shorts programme Animation Bazaar at the inaugural edition of the Margate Film Festival in association with Short Sighted Cinema who gave it some love last year. The screening, taking place at Cliff's, will start at 2pm and tickets are priced very reasonably at whatever-the-hell-you-feel-like. Pretty sweet deal, I'd say. Meanwhile Laura-Beth Cowley's film Boris-Noris continues its strong streak with today's announcement of its inclusion in this year's Manchester Animation Festival, the fourth edition of which will take place at HOME November 13th-15th. The film will be part of the Student Films Panorama on the 15th at 2:20pm. MAF is always a fun one and you can check out the full line-up (including some of our regular Skwigly events and a screening of Chuck Steel: Night of the Trampires) here. Following its inclusion in the touring programme Festival Ciné Junior at the beginning of the year, starting this month Boris-Noris is also part of Les p’tites bobines, a selection Ciné Junior highlights that will be screening at events and before feature films at independent cinemas in the French department Seine-Saint-Denis over the course of the next twelve months. 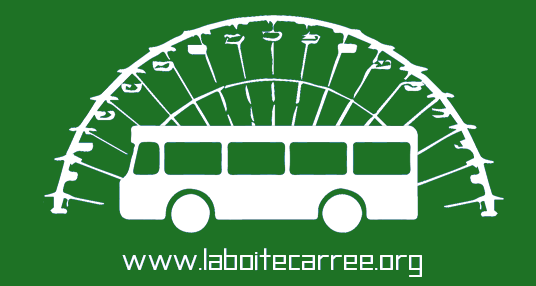 You can check out the Ciné Quartier Libre website for more info, though it'll help if you speak that Franceland speak. 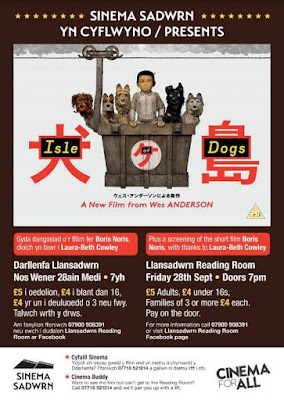 In a similar vein the film will precede a special screening of Wes Anderson's Isle of Dogs this Friday at Sinema Sadwrn in the Welsh village Llansadwrn. It's an inspired pairing and should make for a great event, so check out their Facebook page for more info if you fancy checking it out. "Run over your knees with my bike"? I better see you there, or you're dead to me! LOLZ! I'll also be participating in two panels during the festival, the first of which - Animation Today 1 - will be at 4pm on the 26th, with the second - Short Film Today 2 - at noon on the 27th. Festival passholders can book to attend either of these from 9am on the day, and all of the screenings and events take place at the Watershed here in Bristol. Before then my preceding film Klementhro will be part of Romania's Kinofest International Film Festival that takes place in Bucharest, Oradea, Cluj and Timisoara from September 21st-23rd. I'm hazy on the specifics as to when and if it's part of a dedicated screening programme but it's definitely part of the festival's online competition if you fancy giving it some love. Lastly but not leastly, the continuing adventures of Laura-Beth's film Boris-Noris will see it screen at the Anim!Arte International Student Animation Festival of Brazil next week. There will be several screenings in the coming months but the first will be on Wednesday 26th as part of Session 11 which kicks off at 3pm in the Cúpula Galileu Galilei planetarium in Rio de Janeiro. You can download the full line-up here. 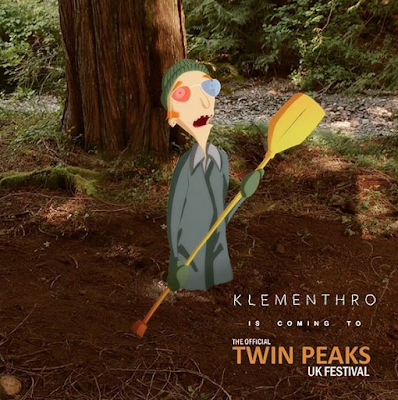 Here's something a little different - rather than a dedicated film or animation festival, the next event to include Klementhro in its line-up will be The Official Twin Peaks UK Festival, which will feature it as part of a screening of David Lynch-inspired short films. This one has special significance to me as I'm an absolute Lynch devotee and everyone who had to endure being around me during the twenty-odd weeks the new Twin Peaks was airing last year will attest that I was absolutely obsessed with it. Although Klementhro came about a few years earlier there was never any denying that its not-always-appealing weirdness owed a debt to Lynch, in particular his leanings toward the humour of repetition and drawn-out-scenarios. 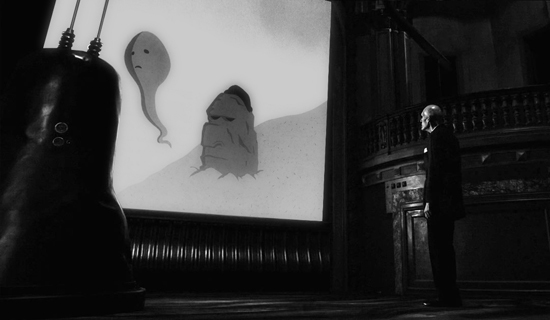 Also the trope, if that's what you could call it, of a solitary figure on a journey peppered by meetings with increasingly bizarre characters has been a Lynch mainstay since his earliest days. All that aside the event looks like great fun, with all sorts of Lynch-ey activities, events and screenings plus a bunch of people from the show itself will be there, so I'm excited to pop along and check it out. If you want to check out the schedule and grab tickets you can head over to the official site. Thirsty for some podcasts? Then boy howdy have you come to the right place. Here are two new episodes of the Skwigly Animation Podcast for your suckling lips to latch on to. 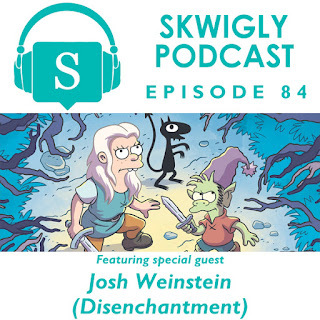 In episode 84 we’re thrilled to speak to one of modern animated television’s most respected writer/producers Josh Weinstein. As a writer Josh has been involved in The Simpsons (alongside partner Bill Oakley), Gravity Falls, Futurama, Strange Hill High and Danger Mouse. Most recently Josh has developed the new Netflix series Disenchantment – which dropped last month – alongside creator Matt Groening. 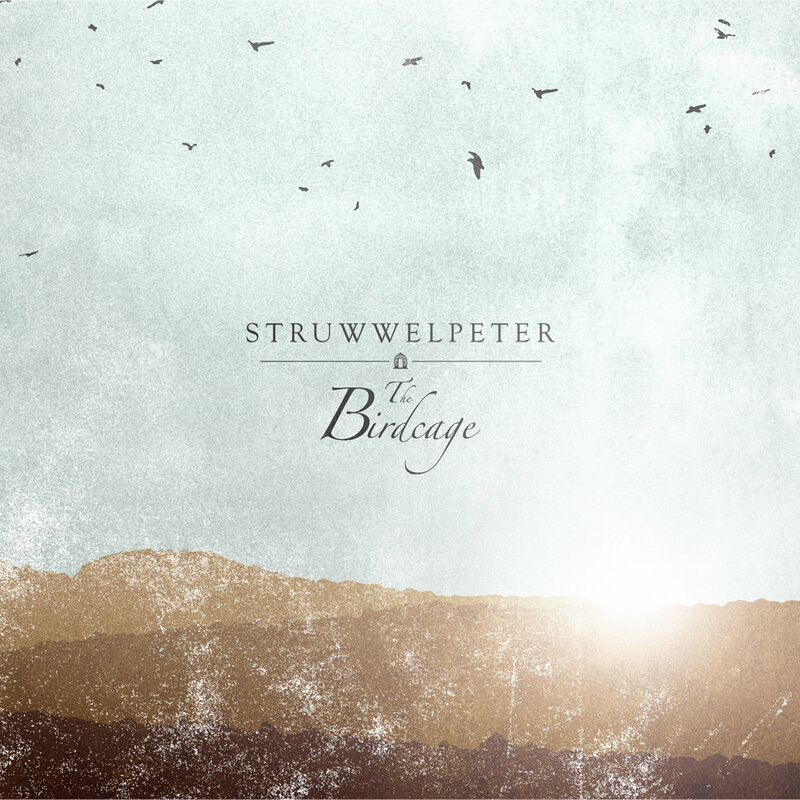 Direct download link here if you're not in a streamy mood. 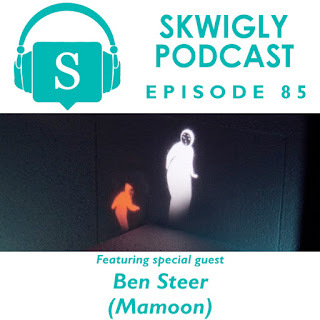 In episode 85 we welcome Ben Steer, director of the multi-award-winning Mamoon, released online this week. Developed as part of Blue Zoo’s long-running animated short films programme, the film is an expertly-crafted visualisation of the emotional toll of the Syrian Civil War in which a mother and child find themselves in peril. What, you want another direct download link? Here, bloody well take it why doncha? So I finally got to see the finished (pending a possible recast of the voices should it land international distribution) version of Chuck Steel: Night of the Trampires at Frightfest the other weekend. Aggregating the reviews that have come in since it premiered at Annecy the general vibe seems to be consistently positive. Certainly there was an enormous sense of achievement among the crew who had gathered in London for the screening and, godless commute aside, working on the film was honestly one of the best gigs I've had to date and I'm very proud to have been involved. With wider distribution hopefully not too far away there are a couple more events the film will be showing up at in the meantime. Although I don't think the film itself will be screening, there's a special presentation with animator Jody Meredith happening at Stop Motion Montreal (who were among the fests to include Boris-Noris last year so they're darn good eggs in my book) on September 15th 7:30pm at Concordia's J.A. de Sève Theater. Later in the month the film proper will be screening in competition as part of the line-up for this year's edition of the Strasbourg European Fantastic Film Festival. These will be 10:15pm September 20th at Le Star Saint-Exupéry, 6pm September 21st at Ciné Vox and 11am September 23rd at Le Star again. Then it October there are a couple of late-night screenings at the SITGES International Fantastic Film Festival of Catalonia. playing at 12:45am on the 6th at the Cinema el Retiro and 1am the following morning at the Hotel Meliá's Tramuntana cinema. Be sure to keep your eyes on the film's website and Facebook page for more news as it comes. If any of those are near your neck of the woods be sure to check them out - and send a postcard! More info on the tour over at the official website.